If you’re interested in ritual coloring the Spirit Keeper’s Tarot and you know for sure you will be buying the physical copy of the deck when it’s released, then hold off on coloring these free Majors. Wait until you’ve got the full package and the totality of instructions before you start your ritual coloring. If you’ve started already, no worries. It doesn’t actually make a difference. You only need to ritual-color once and then you’re done. But some people might want all the work they’ve done consolidated in one place. That’s the only reason I’m recommending that you hold off if you know you’re getting the full deck. No, you won’t be coloring on the physical copy of the deck– instead, the instructions I recommend will be to work with a grimoire reproduction of the cards in the Book of Maps. Scans of the unmodified, original artwork at the as-is card size dimensions is provided for free download. Different versions of the card files are provided so you can customize and personally tailor the card design until the result is not just my work, but our work in harmony. Modify the as-is files provided here until you see yourself in the final product. Please note that these cards are not the same as the final produced Major Arcana for the Spirit Keeper’s Tarot, full deck version. After deciding to officially produce, print, and publish the full deck for sale, which will be a black and white deck, I returned to each card to fine-tune the detailing. 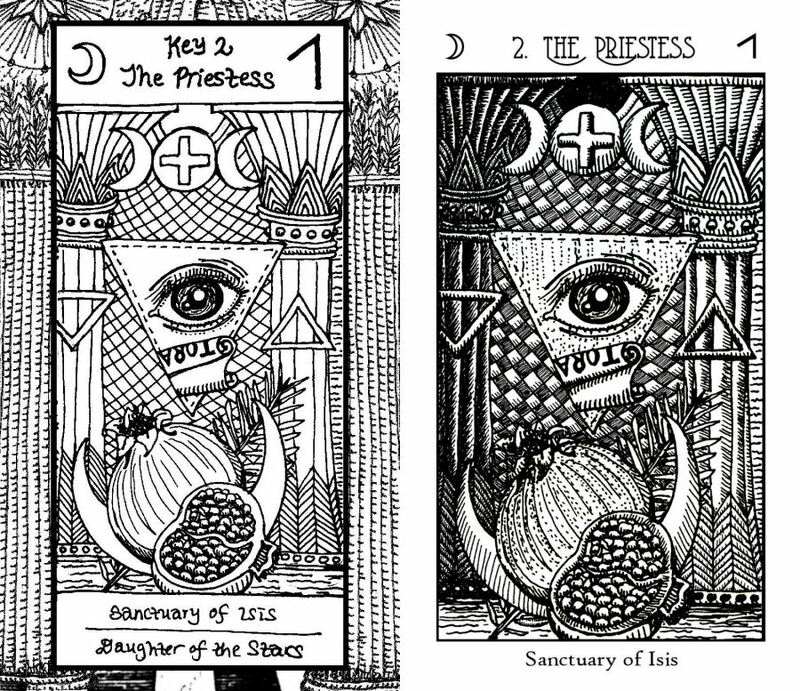 Since the intent for offering the Major Arcana for free was for ritual coloring, in Key 2: The Priestess, I left both pillars blank white so that you can color them in any way you like. However, for the black and white deck that will be for sale, I returned with pen and ink to render it clearer that there’s the polarity of the dark and light pillars. Here’s another example of a change made. I wasn’t satisfied with the way I drew the face for the maiden in Key 8: The Force (corresponding with the Strength card…in case that wasn’t obvious…), but instead of re-drawing the entire card from scratch, I digitally deleted the face part from the original, then drew in a revised face. Final example to illustrate point: The Sun card. Pretty much every single Majors card has been changed between the files given for free download and the final black and white card that will be published. In the above, I went back to the original card I drew and added more detailing so that even though it will be a black and white deck, it won’t lack visual depth. 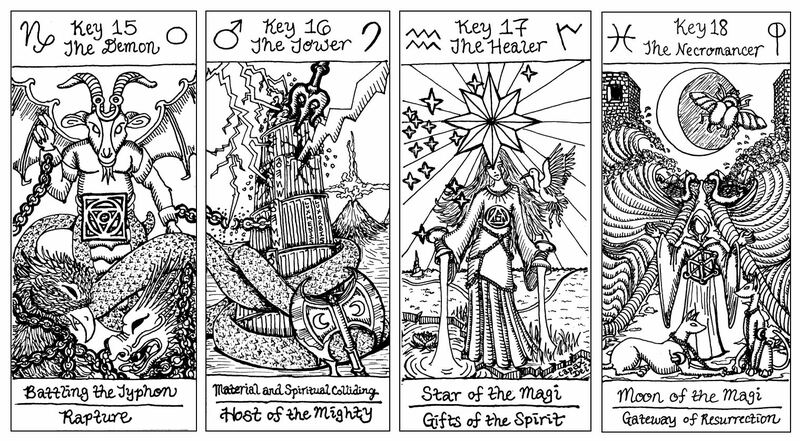 Now for the free download files of the Major Arcana, which are just a shell of the line drawings for the cards to enable ritual-coloring of the Keys. This page is going to dump a lot of information on your lap and then it’s up to you to sort through it and from the mess, manage your own Majors-only tarot deck for revealing and communing with your own Holy Guardian Angel. Although I’m at work on the full 78 deck, at this point, you’re getting the Majors only. I’m also at work on coloring in the full 78 deck, but at this point, you’re getting the black and white line drawings only. 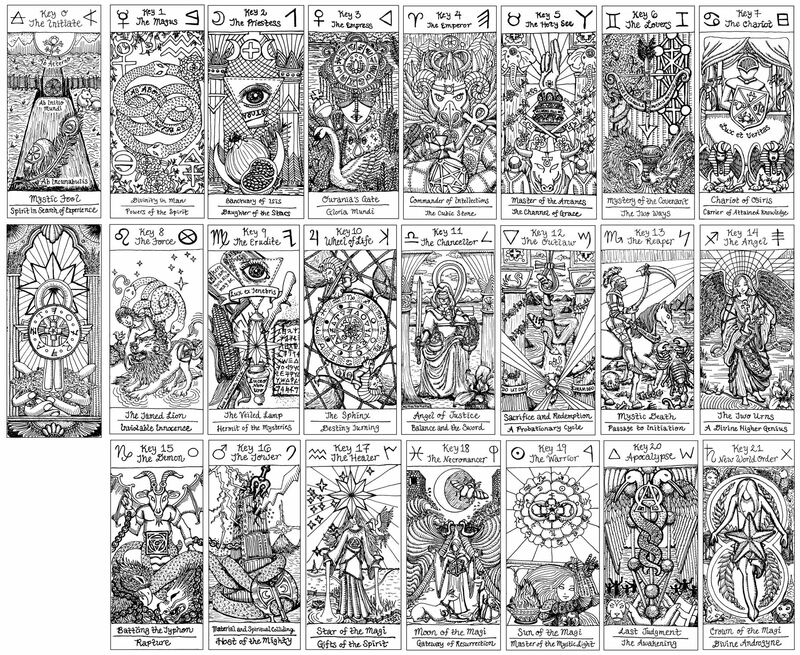 I’m sharing with you, for free, formatted image files for the black and white line drawings of the 22 Majors from a deck I’ve created, called The Spirit Keeper’s Tarot. They’re black and white because you’re going to color them in. That’s right. You. For my own original physical copy of the cards, I’ll be coloring them in with superfine-tip marker brushes using a pointilism technique for the color-fill. You can click on the image for an enlarged view. There are a lot of amazing tarot decks out there for everyday secular readings and fortune-telling. I don’t think this is one of them. I’ve designed and cast the Major Arcana of this deck for a rather narrowly-tailored purpose: to reveal and to connect you to your Holy Guardian Angel. 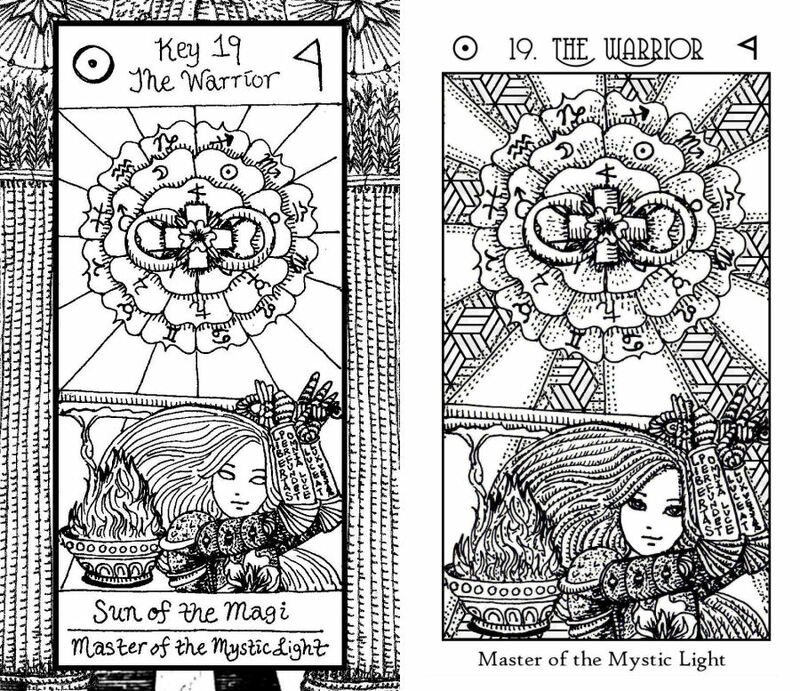 So, if you want to, after you download the files, you’ll be producing your own Majors only tarot deck and coloring in the images based on the instructions I provide in a companion guidebook. The process of coloring in your own copy of the Majors in Spirit Keeper’s Tarot will connect you to your Holy Guardian Angel (HGA) and reveal the Divinity within you, your Path, and the framework of that Path. We each have a different Path, so naturally what the deck has to reveal will differ from keeper to keeper. Yes, you’re going to be a spirit keeper if you work with this deck– more on that later. Completion of the coloring by your hand will in effect consecrate and attune the deck as a nexus point between your HGA and you, so henceforth, the 22 cards can be used by you to communicate directly to your HGA, whoever your HGA may be. In one framing of the concept of the HGA that might make more sense to the rational-minded, the HGA is a personification of your higher genius. So the process of working with Spirit Keeper’s Tarot is one (of many) formulas for unveiling to your conscious mind that inner higher genius, and then to be able to activate controlled connection with that inner higher genius. In other words, activating that controlled connection with your inner higher genius will unleash the gates of your creativity and personal power in such a way that your productivity in all things will be amplified. This path I’ve set out is by no means the only formula for revealing your HGA. It’s just one, but one I believe from the core of me will work for you if you’re dedicated to it. If you don’t want to use my offered method, then don’t. If you do, then follow the instructions as closely as you can. I’ve dedicated an entire section in the accompanying guidebook to go into further detail about this concept, or my conception, of the HGA, so be sure to read through that section before you proceed with the cards. I’ve encoded the Majors to reveal to each deck’s keeper the four sacred relics: the Spear (or Lance) of Destiny, the Holy Grail, the Sword of the Spirit, and the Bread of Life (or the recipe for it). I perceive the four sacred relics as metaphors that help us to better define and understand our own higher purpose and life goals. How does the Spear of Destiny manifest in your life path through the element of Fire in your world? What does that instrument look like for you? What is your personal Holy Grail and how has it been born through the element of Water for you? The relics correspond to the pinnacle of each elemental suit in the Minor Arcana, so later, the Minor Arcana cards will illuminate the minutiae for attaining these four sacred relics. The Majors show the individual keeper what each of these metaphors represent specifically for that particular keeper, and these insights are revealed by the keeper’s one Holy Guardian Angel. This guidebook does not contain card meanings. If you want to know what The Empress means in tarot, there are, like, a bazillion books on card meanings for that (including, *cough* Holistic Tarot *cough*). So this guidebook won’t tell you what the cards in this deck mean. I’m going to presume you know already or you can source that information on your own. Instead, the guidebook is about the specific symbolism found on my variation and interpretation of the Majors for the specific purpose of connecting you to your HGA, your divine higher genius. The guidebook sets out the formula, or the process for how to craft your own deck based on the image files of the Majors I’m providing. It’s also a workbook, with lines and space provided for you to write in the pages to document your progress, your thoughts, impressions, and insights based on the prompts provided. YOU NEED THIS. YOU HAVE TO READ THIS. Let me just keep it real with you and perhaps even save you from wasting expended effort. If you don’t think you can manage to read this guidebook cover to cover, word for word, without skimming or skipping, in the order suggested and honor the preliminary study points as instructed, then there is probably no reason for you to go through the trouble of producing this deck. You’re not going to get any good mileage out of this deck. Again, this is not a common reading deck. It is tailor-made for a very specific purpose and the guidebook is your operation manual. Please, please read the operation manual before you try to operate the heavy machinery. I don’t think it’s necessary to print out a copy of the guidebook, but if you want to, then know that the PDF download is formatted to the Trade Paperback size (not US Letter, so it’s not 8.5″ x 11″), which is 6″ x 9″. If you want to print it from a home or office printer, there’s a function that allows you to set your printing instructions to “print to fit” and still print on US Letter (or European A5, whatever the printer standard is in your neck of the woods). The PDF download also has mirror margins and a gutter, which will look uneven if you print it out by yourself, but is necessary if you’re going to get your book professionally bound. For those who are familiar with using Lulu.com, then you can upload and order a printed copy of your guidebook in Trade Paperback trim size (that’s 6″ x 9″). Regrettably I won’t be providing step-by-step instructions on how to use Lulu.com to print your guidebook, but I’m sure you guys in the tarot community will help each other out. Choose any of the provided options for a front cover and any for a back. Yeah, there are no titles or byline on the covers. I kind of like how book covers look when they’re non-descript like what you see above. But of course, you can change it up and do whatever you want. Custom-design your guidebook cover and use that instead. For the binding, I would go with spiral-bound, because that’ll make it easier for you to use as a workbook. 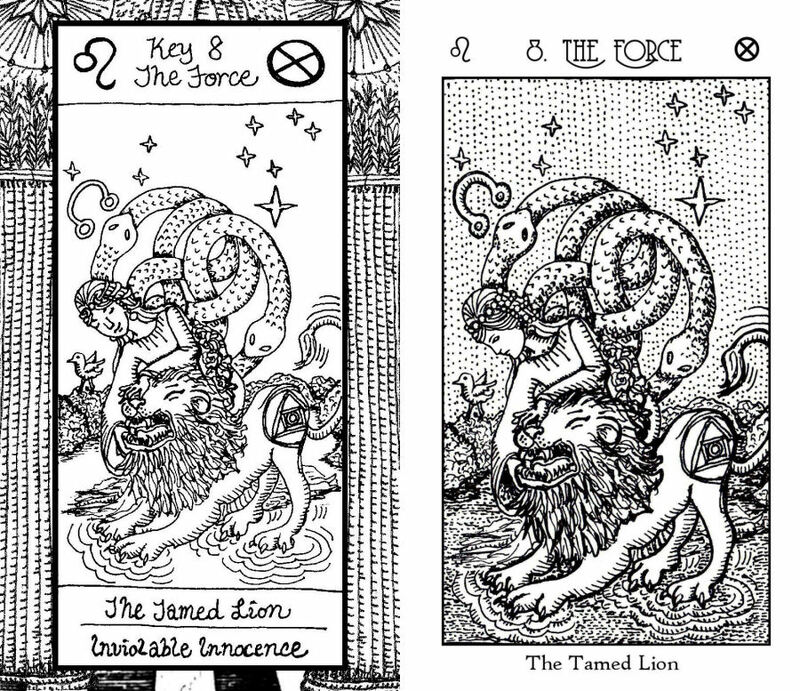 The following card image files at 2.75″ x 4.75″ or standard tarot card size. You can upload the image files and order a print copy through MakePlayingCards.com, and here is the direct link to the option for standard tarot card size. 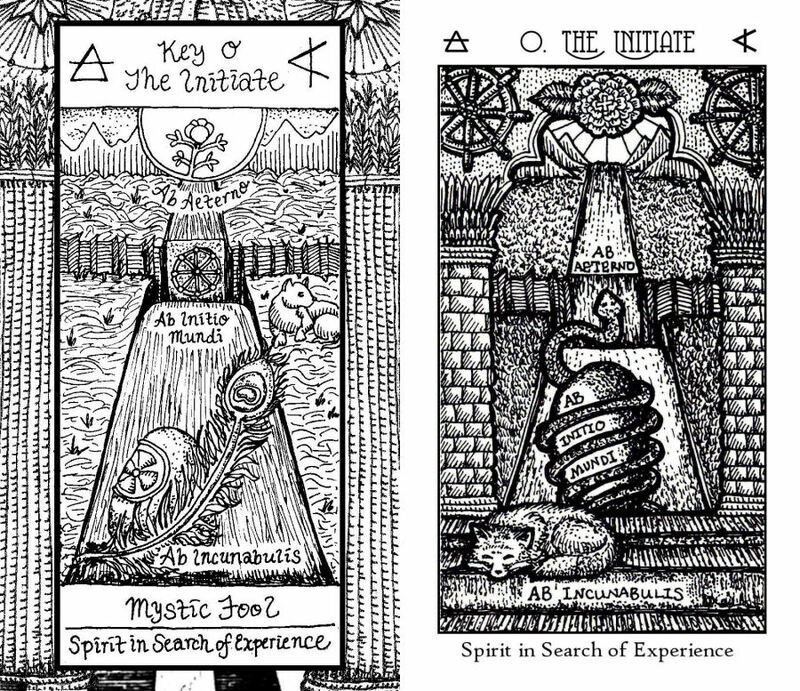 The following card image files at 3.50″ x 5.75″ or a dimension that’s more akin to oracle cards. You can upload the image files and order a print copy through MakePlayingCards.com, and here is the direct link to the option for the oracle card size. The following card image files at 5″ x 7″. You can upload the image files and order a print copy through MakePlayingCards.com, and here is the direct link to the option for the giant card size. Note: Because these image files are in black and white (because the art is black and white…), when you upload the files to MakePlayingCards.com, the automatically generated message might warn you about low resolution. I personally didn’t find an issue, but proceed at your own caution. Since that’s the site I like to use to print single copy tarot or oracle decks I’ve made for myself, all my image files are formatted to work with www.makeplayingcards.com. Should you even go with MakePlayingCards.com or any print-on-demand service to print out the cards for coloring? I haven’t one foggy clue. That’s probably not the way I would go personally, but it’s entirely up to you and you need to exercise your own judgment. I’d probably just professionally print out a set of black and white Majors in tarot or oracle card size for use as-is, in black and white. If you think I can or should guarantee that these formatted image files will work perfectly with makeplayingcards.com or any other third-party card printing service, then you’re delusional. I did my best, but that may not be enough. Once you upload and preview on the printing site, you may see that you need to add more borders for the margins so that imagery you want included on the cards don’t get cut off. So do your own due diligence. Also, seek out members of the tarot community who might be more tech-savvy and who has created for themselves a better and working set of formatted files. Ask them if they’re willing to share. If they’re good folk, they should say yes. When in doubt, work from the home printables and control the printing start to finish, on your own. That’s really the best way to control the quality of the output. These are in the custom, non-standard dimensions that my originals are in. Although most professional print-on-demand services might not be able to support this non-standard size, with just 22 cards, you can probably print them out on cardstock by yourself with any home or office printer. My physical cards are 2.75″ x 6.236″. The PDF and DOCX printables provided here will be 3.0″ x 6.8″. As I said, since there are only 22 total cards to print, if you have access to good quality paperstock for the cards and a printer, then you can just print out the cards yourself, and cut them out. Aligning the card faces and card backs to print on both sides can be a bit of an art, however, so a bit of calculation and tweaking on your end may be needed. For my own copy, I purchased white heavyweight cardstock that’s 100 lb. cover, 270 gsm in standard US Letter size. 3 cards fit on each sheet, so that’s how I printed them out, then cut them myself, and rounded the corners. Not all printers will print on cardstock as heavy as 100 lb. (270 gsm), however, so you need to check your own printer settings to confirm. Most nice-office printers will service this just fine. For the skilled graphic designers who know what they’re doing and want to format their own version of Spirit Keeper, here are the original high-res scans. Since I drew these card images on standard US Letter cardstock, there are 3 cards linked together in every scanned image file. If you want to use independent images for projects relating to personal spirituality and not necessarily for cards, here is a file folder of just the image files (no captions). If you want to use image files of my original card drawings for projects relating to personal spirituality and not necessarily for printing out a set of cards, you can use the images from this file folder. Yes, absolutely go for it. This is part of the ritualized process you’ll undergo. So the decisions you make in terms of deck modification can be quite significant. The default card back design. You don’t have to use the card back design option I’ve provided. You can absolutely design your own and use your own customized card backs. In fact, I encourage it. However, you’ll need some rudimentary graphic design skills to make one that’s going to be print-friendly. But if you can, then you should. Crafting your own card back design for these cards will really add to your process. Nonetheless, don’t worry–if you can’t and don’t craft your own design, it won’t take away from the process. Yes, go for it, especially if you’ve got a handle over graphic design. You can use the image-only JPG files to design your own cards with your own titles and captions. Psst…Tip: To create your own card captions with printed type, use the images-only files, insert each into a 2.75″ x 4.75″ template, position the image block near the top (or bottom, whatever your fancy), and there’s just enough room left to type out your own card title. Obviously you can choose any font type you like, but if you want to know which one is used in the above sample, it’s Cambria. I am not a graphic designer. Everything I know about graphic design and digitally rendering these card image files I learned on my own. So yeah, chances are very high you could do a better job polishing the original files to print better quality cards. Go for it! Please also help each other. Please feel free to tweak the files and share them with your friends who also want to print out a copy of the Majors but don’t have your skills. Yes, you are totally free to do that and yes, I encourage it. So, for instance, if you want to take out the solar cross in Key 2: The Priestess that’s drawn inside the full moon at the top, go for it and replace it with something more personal to you. If you want to digitally edit out the twelve Western astrological glyphs in the zodiac wheel in Key 3: The Empress and replace them with another astrological system of twelve glyphs, go for it. You can edit out the features on the two sphinxes in Key 7: The Chariot and either keep them blank if you prefer, or change them to something that you prefer. Want to tweak some of my lines? Most of the eyes in the sentient figures are not filled in. That’s just personally how I like it aesthetic-wise, but if blank eyes freak you out and you want to fill them in, go for it. Can you totally crop out certain symbols and draw in your own? Sure. Swap out one of the cards I’ve drawn that you don’t like and insert your own, but use the rest of the deck? Why not? The editing options you have go on and on. Yes, go for it. Craft and tinker with the deck until it’s yours. If you are willing to donate your time, effort, and skills to modify the 22 Majors into a formatted derivative deck of Spirit Keeper and offer it freely to the public, that would be awesome. Please go ahead and share it on your own website, provide a link back to this page, and let everybody know that they can opt to use your formatted derivative version. Not only would this be permitted, it would be amazing, and I’d be ever so grateful for your contributions. I did my best in terms of my design skill levels, but it’s limited, so if a skilled artisan is willing to pick up where I left off, and then release the finished product out to the public for free download, please, please do so. Your community thanks you. If you’ve colored in the cards and are now willing to share them with the public for free access and download, also awesome! Please help each other out. Some of you are seasoned with using third party print-on-demand sites to upload and print books or decks. Please be a friend and extend your helping hand to walk others through the process. If you’ve innovated a neat way to modify the cards, please share with others so that they might learn from you or at least be inspired by what you’ve done to then do their own thing. In short, you’re going to start with Key 0: The Initiate, read the entry for that Key in the guidebook, and then proceed to color in the black and white line drawing for Key 0 and create your first tarot card. Then you move on to Key 1, read its entry in the guidebook, then color; then Key 2, and so on. For the purposes of my formula, yeah, please go in the consecutive order that the Keys appear in the guidebook. In some instances I provide exact color choice. My recommendation will be to follow my color instruction. In other instances, I give a couple of different color options. For those, go with the color symbolism that resonates more deeply with you. What you choose versus what you don’t is part of the process, is intentional, ritualistic, and will pave the groundwork for connecting to your HGA. Where I do not give any instruction for color choice, you choose your own. And that will make all the difference. That’s the part that will be unique for you. When you’re done with all the Majors, the totality of color choices you’ve made will become part of the ritualized invocation process. The concept of making the images in the likeness of the creator will bring the greatest impact and here, you are the creator. This is your tarot deck. Thus, where there are images of human figures to color in, I recommend that you do so in the image of you. Gendered depictions are symbolic: they represent the inner masculine or inner feminine aspects of you. Logistically, use whatever medium you like, whether that’s colored pencil, water color (this is going to get tricky– you’ll need to print on cardstock that will take watercolor well), or colored marker brushes. No you won’t. Well, you will if you continue on with that attitude! If you’re beginning with the deliberation process of whether or not you can color in and produce an industry-standard-publishable-looks-professional set of Majors, then you’re missing the point entirely. I intentionally did not begin with considerations for industry-standard-publishable-looks-professional. That’s why everything is handwritten, lines are free-handed and eye-balled rather than design-perfect. I didn’t think about the logistics of future-publishable-resolution or industry standard card size. I started with me, me, me and oh– me. What’s going to work for me? What do I like? What is my perspective? And although that comes across as self-centered (okay, not just comes across; it is) that adjusted mindset put me more in tune with Divinity, hearing Deity, and getting fully in the zone for memorializing expressions of the divine realms. Because I wasn’t concerning myself or weighing myself down with materialistic and superficial considerations. Yes, absolutely you can use just the black and white version of the Majors. But the nature and capacity of the cards will differ significantly between a black and white version and a version that you undergo the ritual coloring with. So it’s not even just about black and white versus in color. I genuinely believe the total energy body is going to be different. They’re not even going to be in the same universe of tarot decks (I believe). The black and white version, I think, is going to be just like any other Majors-only tarot deck set. You can use it in any way you feel called to use it. But as one tarot reader (me) to another (you), I just don’t think these particular cards will read well in ordinary settings. The design and style is a bit too busy. I think it’s pretty evident by intuition and first impression that these cards are intended for something much more. But for the aesthetic value, just my opinion here, I think if you found a way to get an antiqued off-color paper look and then printed the black and white line drawings on an antiqued tea-toned paper, it’d look pretty damn cool with kind of an Old World feel to it. So if you want to modify the file I’ve provided here to produce a black and white deck on an antiqued background just because you want it, I say go for it. That sounds amazing! Can you print and work with only one or a couple of the cards from the Majors? Can you isolate only a few of the cards for a focused practice, such as printing it into poster size, coloring it in, and using it for meditation or pathworking? Can you print, color or leave uncolored, any of the card images provided and turn them into talismanic keychains or other charms and goods? The answer is yes to all of the above. Yes. Go for it. You can mix and match the image files of the 22 Majors in any way you can come up with that’s for personal and spiritual purposes. Don’t Read Anything and Do Your Own Thing with the Cards. Yeah, that’s okay. I mean, it has to be okay, right? What control do I have over you? Actually, this would be kind of neat. I’d love it if you share how you’ve diverged from the prescription to do your own thing, why the divergence, and your experience with taking your own path. Color Harmonies. There’s a technical aspect to artistry and here, we’re looking specifically at color harmonies that artists will consider. You can take a page out of their book and apply on metaphysical implications. Here’s a great link that offers basic techniques for combining colors. In other words, within one single card, consider a fixed set of color combinations (think: Tarot de Marseille block printed decks) and how you might want to work with metaphysical implications of color combos. Stringently set color combos can = intentional color symbolism. Crafting with the Images. Yes! In fact, that’s a great idea. Print out one of the card images on adhesive paper, color it in, and turn it into a sticker that you then affix to a candle. Or print it out in a larger size, color it in, and frame it, to keep somewhere special to you. Add parts or whole card images to your personal grimoire, within the context of tarot or having nothing at all to do with tarot. All these methods of re-purposing Spirit Keeper would be amazing. Can you produce a set of the Majors in a different size dimension than the ones provided or even a different shape, like octagon cards or circle cards? Sure! Go for it! But design and formatting wise, you’re on your own. You’ll need to figure out the logistics by yourself or collaboratively with other members of the tarot community. Can you go through the work of coloring in the cards and then gifting someone with a copy of the colored-in cards you’ve made? Yes. Can you go through the work of coloring in the cards and then selling your colored version? No. Please don’t do that. Can you produce your own derivative from my copyrighted work and commercialize or profit on your derivative? No. Please don’t do that. Can you produce your own derivative from my copyrighted work for your personal and private, non-commercial uses? Yes, of course. And, um. That’s kind of the point here. I hope you’ll do that. Can you produce your own derivative, which is a mix of my designs and yours, and offer it for free to the public? Yes, of course. Just make authorship attributions clear so no one gets confused about what you did and what I did. Can you use any of these images on your personal blog, social media, etc.? Yes. Of course. I even provided file downloads for images if you want to use them for just such an application. Can you create a translation of the deck and guidebook into another language? Yes, of course, but then you must offer that product to the public for free. I would ask that you give free access to that work. This is a royalty-free limited license to use my work for any of your personal, private, and non-commercial uses. These works have NOT been dedicated to the public domain. They are NOT public domain images. Copyright of the work remains with me. Commercial uses of the work are not licensed or permitted, with the exception of the below conditions. What is being granted here is a royalty-free limited license to use the works. Authors who would like to include images of tarot cards in their published works (which would be commercial use) may use any or all of the images from Spirit Keeper freely. Yes, for free. Please include an attribution to Benebell Wen. If you are using images of the cards that have become derivatives, where you or someone else has added color, made modifications, etc., please attribute that individual for their portion of the work. In other words, I would appreciate it if it is made clear who did what and I don’t get attributed to something I did not do. Independent artists who would like to turn images from the deck into merchandise for sale may do so under a royalty-free license. All I ask is that I should get one of such merch for free, don’t ya think? You qualify as an independent artist if you are a sole proprietor. So yeah. As long as I get free stuff from you, sure, you can use any of these images or your derivatives of these images to produce and sell merchandise if you are an independent artist or sole proprietor. No to corporations.